“Say what?” “Can you hear me now?” These familiar catch-phrases have been used in popular commercials to get our attention. But hearing words are no guarantee that we are actually listening. According to Google, to hear means “to perceive with the ear the sound made by someone or something.” However, listen means “to give one’s attention to a sound.” Listening happens when we are drawn into someone’s words with interest, and choose to engage ourselves with them. Hearing occurs by happenstance, but listening intently is a choice. Jesus struggled against people who were hearing but not listening. He told a parable to illustrate this. A sower tossed seed over different kinds of ground. Some seed fell on the hard path, which was trampled under and never grew. Some fell on rocky soil, which withered as soon as it sprouted. Other seed feel among weeds, which were eventually choked out. But some seed fell into good ground, grew up strong and reproduced. The seed represented the Word of God. Many would hear it, but few would receive it. As Jesus told the parable, he interspersed a warning several times to his audience: “He who has ears to hear, let him hear!”(Luke 8:4-8 NASB)They may have been hearing the Word of God, but they were not really listening. Last week I was disappointed by a dear friend who has recently relapsed into her addictions. I mentioned this concern to one of our mutual friends, who said, “She has all the tools she needs. She knows what to do.” Wow. My cloud of guilt and shame lifted as I was comforted with the truth – my struggling friend had heard already everything that needed to be said. It was her responsibility to choose to listen. It was up to her. She had to decide to actively respond to God’s Word. She had to want to get back up again. God wanted me to surrender the responsibility for results to Him. My job now is to be faithful to pray for her and trust Him to work it all out. So I’ve learned a new way to die to myself. I must choose to decrease so He can bring abundant increase. I need to practice what Paul did when he was faced with something he could not resolve on his own. “But he said to me, ‘My grace is sufficient for you, for my power is made perfect in weakness. Therefore I will boast all the more gladly about my weaknesses, to that Christ’s power may rest in me” (2 Corinthians 12:9 NIV). I’ve been encouraged by the people of God and re-calibrated by the Word of God. I’ve chosen to lean in and listen closely as God communicates to me through the circumstances, my friends, and the Holy Spirit. I’ve made a choice to be a different person come Resurrection Sunday. I’m making this time of lent a time to listen to God. Interestingly enough, God wants us to listen to him speaking through the people he has placed in our lives. Can you hear Him now? About the author: Exchanging hurt for hope is Sheryl Giesbrecht’s focus—a message she shares with audiences as a radio and television personality, author and speaker. She served as Focus on the Family’s columnist for Pastor’s Wives for four years. Hundreds of her columns, magazine, and devotional articles have appeared in Focus on The Family Magazine, Just Between Us, Discipleship Journal, CCM, Walk Thru the Bible’s – and Tapestry, Live-Living and Charisma publications. You can find more about Sheryl at www.fromashestobeauty.com, or follow her on Facebook, Twitter, and Instagram. Sign up to receive Sheryl’s weekly blog on her website: www.fromashestobeauty.com. 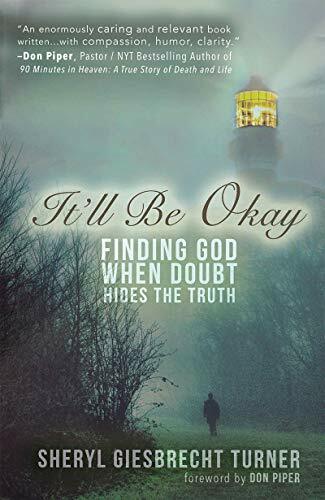 Sheryl’s latest book, It’ll Be Okay: Finding God When Doubt Hides the Truth , addresses the healthy role doubt can play in a Christian’s life. She encourages addressing doubts head-on to feed faith, knowing that misgivings and fears can be happily resolved through the grid of God’s Word—without leading to an unbelieving way of life. Join the conversation: Have you ever felt shame as you approached God?